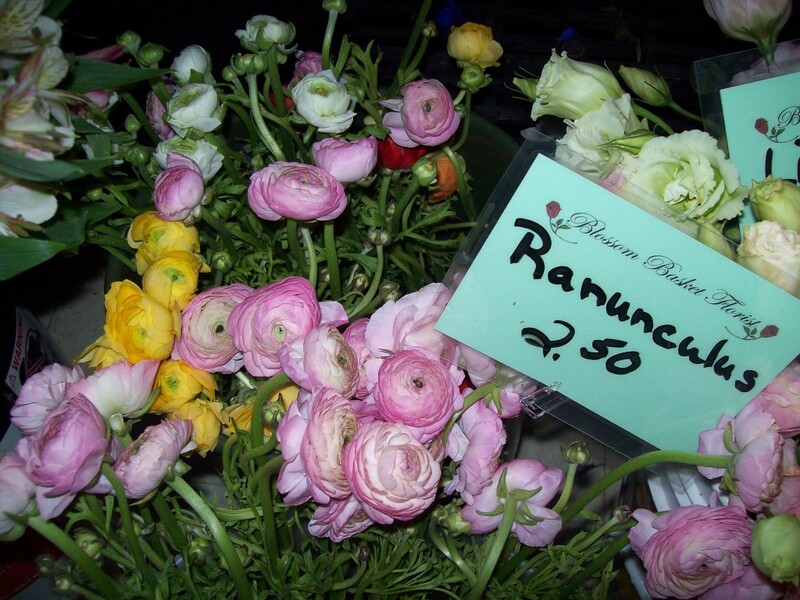 Ranunculus – a current wedding must have is on sale this week. Only $2.50 a stem while supplies last! 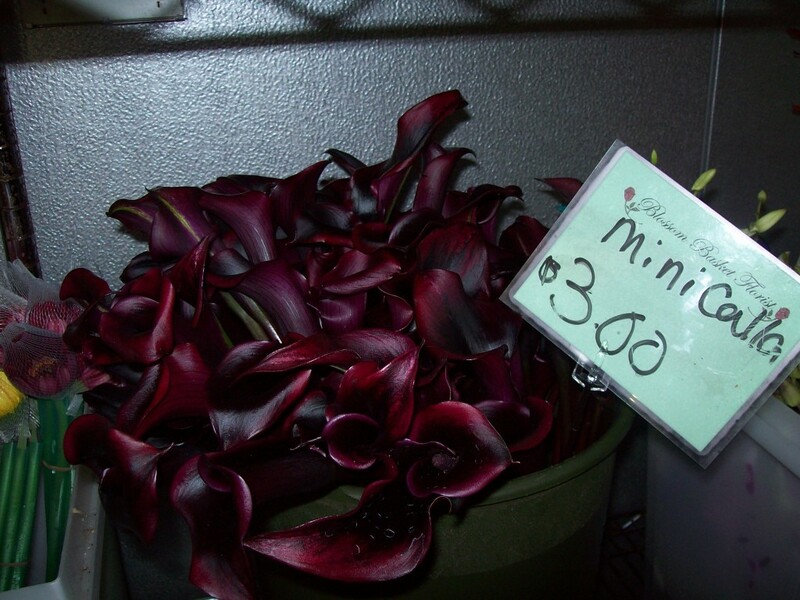 Hot chocolate mini calla lilies – a lovely dark plum color. This week only $3 a stem (while supplies last). Come in today or call 217.367.ROSE to order! Gerbera Daisies on Sale this Week! Only $2 a stem – while supplies last! Call us at 217.367.8354 to order today! 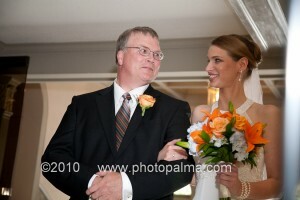 Manuel Crispin of PhotoPalma sent me these beautiful pictures of J & M’s May 29th wedding . To see more of Manuel’s work visit www.photopalma.com. 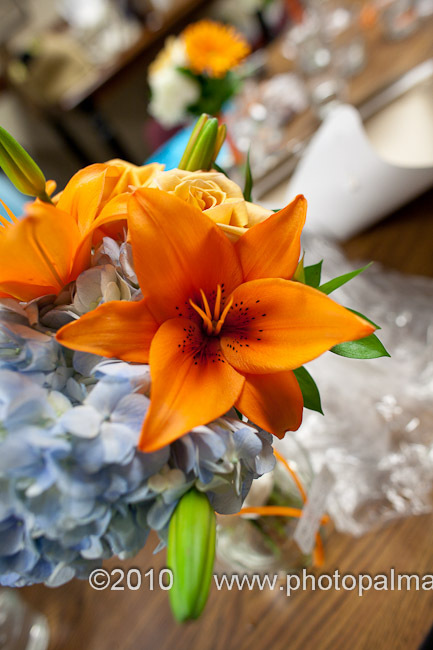 Blue hydrangea contribute the form and volume of this bridal bouquet while orange Asiaticlilies and orange unique roses contribute to the elegance and texture with their classic silhouettes. For the rest of the wedding party M was looking for a little more playful style. 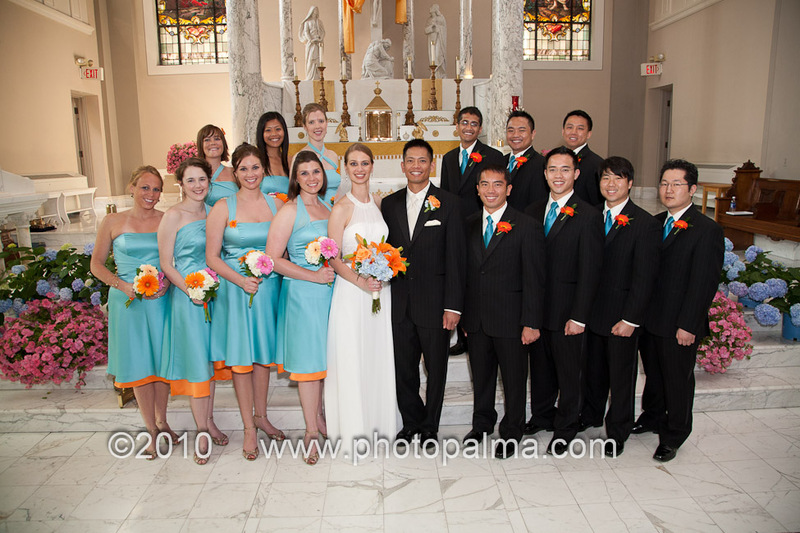 We chose to keep the blue hydrangea for color and some constancy in the bridesmaids’ bouquets but added gerbera daisies. 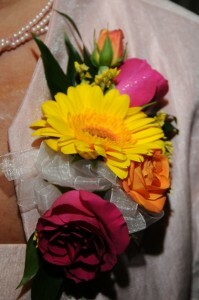 For the groomsmen she chose orange Germini (mini gerbera daisy) boutonnieres. Congratulations on your wedding J &M – may you be blessed with a life time of happiness. Thank you for letting us be a small part of your wedding day. Thanks again to Manuel Crispin of www.photopalma.com. 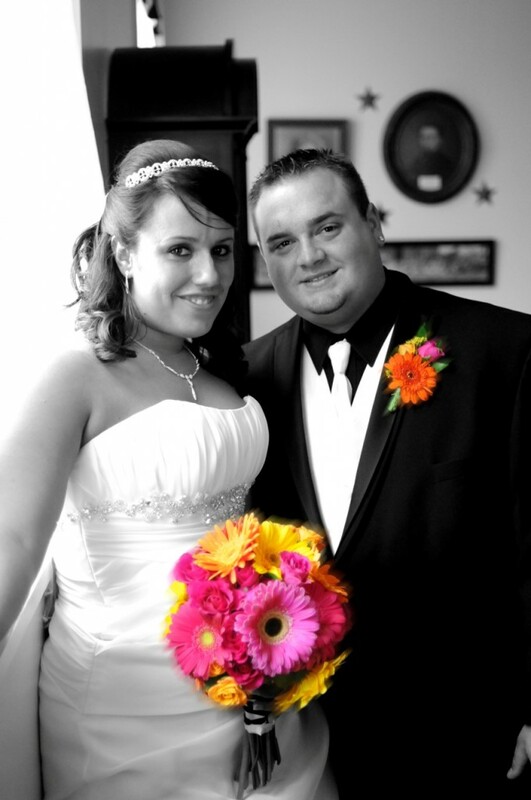 In this bridal bouquet we filled the voids left between the large round silhouette of the gerbera daisies with bright spray roses in orange and hot pink. 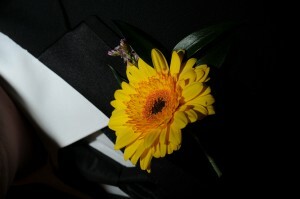 The mini gerbera daisy, otherwise known as the Germini, is the perfect choice for coordinating boutonnieres and corsages. 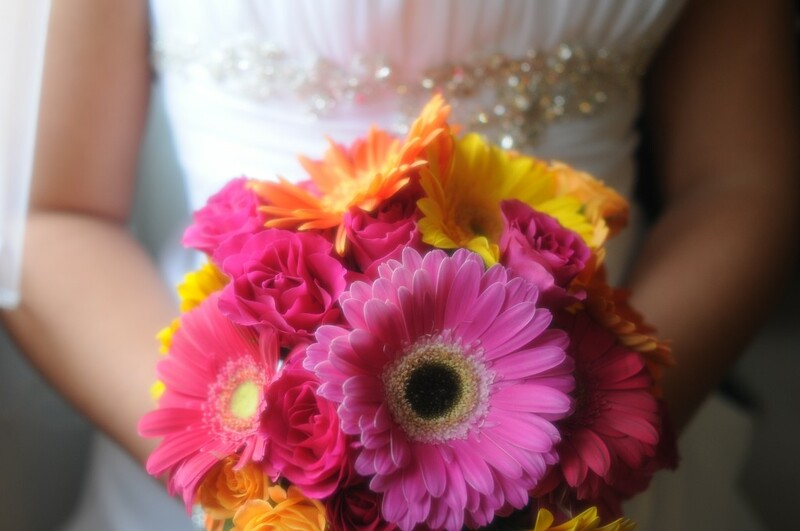 Gerbera daisies have been a favorite of bride’s for many years now. 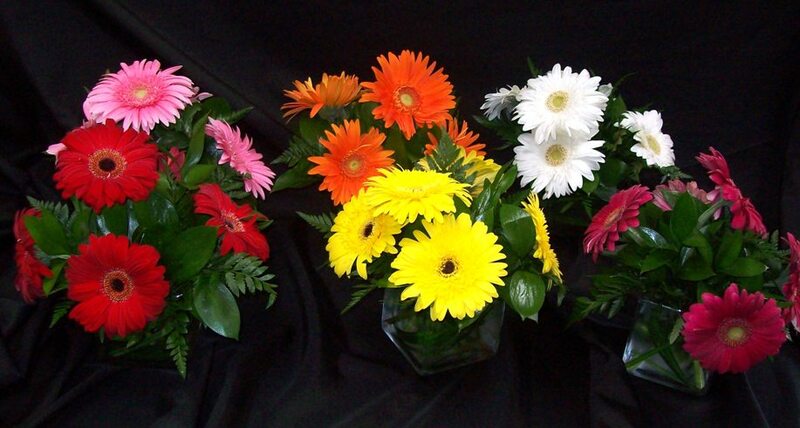 As bright and bold colors become the standard for wedding flowers gerberas have become a bridal flower staple. Thanks again to Ghent Photography for sharing these beautiful pictures. And to J & J the bride and groom for letting us be a small part of your special day!